Massive range of valuable bonuses that get better the more you play. Impressive selection of games on the downloadable casino client. Table games software is lacking in quality. We have prepared this Miami Club Casino review not only to highlight the fantastic opportunities of playing at the site, but also to shine a light on some of the potential obstacles that might prevent you from maximizing the opportunities. For example, you will not be eligible for Miami Club Casino bonuses if you live in the UK, the Netherlands, Russia, Bulgaria, Poland, Hungary, Greece or the Ukraine. Residents of the above countries, France, Canada, Israel and the eight American states from which you will not be allowed to register an account, should navigate to our casino reviews where you will find plenty of alternative opportunities for online fun and games. For everyone else, please continue to read our Miami Club Casino review to find out what you can expect from this excellent site. Miami Club Casino was launched in 2012 by an online casino group with a pedigree stretching back to 2007. It is worth visiting just to experience the rarely used WGS Technology software, which although looking a little tired (the table games particularly), does have a good reputation for high payout percentages. Most players will not have played any of these games before. One standout feature of Miami Club Casino is its wide range of casino tournaments. These are hosted daily, weekly and monthly, and consist of freeroll and paid-for events – some with guaranteed prize pools of up to $5,000. What we really like is that they are not slots-exclusive tournaments. Players can compete in video poker, Blackjack and Keno tournaments each week. In the process of compiling this Miami Club Casino review, we had the opportunity to check out plenty of games. On the full download version of the software there is more than 100 slots, 23 video poker games and 17 table games. There are also some unique specialty games you will not find elsewhere, and these are worth experiencing just for the novelty value. Unfortunately, the full range of games is not available on the Instant Play version (for instance for Mac players) or the mobile app. This can be frustrating if you are playing in a month-long tournament on a specific slot. Generally the quality of the gameplay on the Instant Play and mobile versions were okay, but not as good as on the full Miami Club Casino download. This is where the casino really shines. 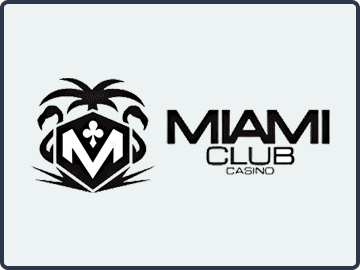 Miami Club Casino offers new players 100% bonuses on their first eight deposits up to $800 ($100 max bonus per deposit). Thereafter players can take advantage of daily reload bonuses through the Miami Club VIP Rewards program. The clearing requirements vary according to the bonus you are claiming, and these are clearly displayed in the cashier section of the software. There are a couple of conditions that players should be aware of. The bonus funds credited to your account can only be used to play slots, Blackjack and video poker. Bets made using bonus funds are subject to a $10 maximum (important info if you want to play in valuable tournaments) and only one deposit using Skrill or Neteller is allowed per player because of potential fraud issues. Miami Club Casino offers a variety of methods to deposit funds into your account but, as mentioned above, you will only be able to claim one bonus if you use Skrill or Neteller. Alternate free deposit options include Visa, MasterCard, EcoPayz and Bitcoin. We recommend Bitcoin because of its higher deposit limits and lower withdrawal limits (plus Bitcoin withdrawals are free of charge). If you are unable to use Bitcoin for your deposits and withdrawals at Miami Club Casino, you can cashout by check (min. $150, max. $2,000, fee $30) or wire transfer (min. $150, max. $2,500, fee $60), but expect to wait up to two weeks before seeing your money. Generally, Miami Club Casino has a good reputation for processing withdrawal requests provided you have verified your account. Subject to making a first deposit of $25 or more, you will be automatically enrolled in the Miami Club Casino VIP Rewards Program. The VIP Rewards Program provides players with daily and weekly deposit bonuses, and – as you climb through the six status levels – cashback on your net losses and enhanced Comp Points for playing any of the casino´s games. Comp Points can be exchanged for cash at any point, and it is worth looking out for double and triple point offers. Usually these consist of playing on selected slots throughout the month, but during the time we were compiling this Miami Club Casino review, we found we could earn double Comp Points by playing Keno. The 96.54% return rate on the 13-number bet, plus the double comp points and bonus made us very EV+. If you have a question about Miami Club Casino, or are just feeling like talking to somebody, there are plenty of options to speak with Customer Support. Players in the US can take advantage of a toll-free number, while live chat and email is available for everybody else. Customer Support is available 24/7 and we found the “associates” had an industry-standard knowledge. Miami Club Casino has a responsible attitude to fair gaming and player security. Certified Game Payouts can be downloaded from the website and an entire page is dedicated to fraud prevention and player security. The site dedicates a further page to responsible gambling, and provides links to support sites as well as offering a self-exclusion service. A good range of modest bonuses provided you don´t deposit using Skrill or Neteller. Unique gaming software that kept us entertained longer than at some other casinos. Clear terms and conditions on an easy-to-navigate site and no hidden surprises. Table game software badly needs an update. It was built the same time as the Ark. $10 max bet from bonus funds is restrictive when you want to play in a tournament. Even at the top level of the VIP Rewards program, the bonuses are not going to attract high rollers. If you are a modest stakes player, who can deposit using Bitcoin and enjoys a bit of novelty, Miami Club Casino is probably an ideal destination. That´s not to say the site is unsuitable for everybody else. Just that by being eligible for the maximum bonuses and free withdrawals, players transacting in Bitcoin will get more from playing at Miami Club Casino. Undoubtedly there are plenty of opportunities for a profitable experience at Miami Club Casino. The bonuses, the tournaments and the VIP Rewards Program keep the funds rolling in. Watch out too for double and triple Comp Points. Overall, we recommend everyone should experience the site – at least for the novelty value of playing WGS casino games that are hard to find on a site as good as this. Visit Miami Club Casino Now!